Karuppiah Mahalingam started his medical studies in Madras University in South India. He trained in General Surgery and Orthopaedics in the Republic of Ireland, working as a Consultant Orthopaedic Surgeon at Cork University for more than ten years before moving to a private practice. 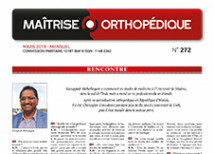 In this interview, he tells us about his years of experience in total joint replacement.